This isn’t Bonil’s first run-in with Supercom. 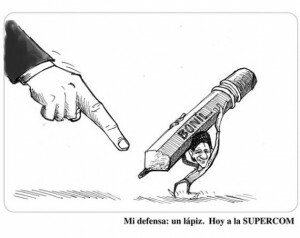 In February 2015, Bonil was charged with socioeconomic discrimination for a cartoon mocking Afro-Ecuadorian legislative assemblyman, Agustin “Tin” Delgado. Supercom forced Bonil and El Universo to publicly apologize for the cartoon, and Bonil was fined $500,000 for the infraction. Adding insult to injury, an individual claiming to be a member of ISIS threatened to “kill the wretch” after El Universo ran a Bonil cartoon mocking the terrorist organization in early March 2015. CBLDF will continue to follow this latest governmental review of Bonil’s work and will post updates as more information becomes available.